Inputs horizontal/vertical 8ports 1 terr. Outputs horizontal/vertical 8ports 1 terr. SAT:tap GAIN +6 10dM. Terr:tap loss 0-10dB. Isolation port to port 25dB. Isolation trunk to trunk 30 dB. Control disege 2.0. Control vertical 11.5-14.0. Control horizontal 16.0-19.0 volts. Control drain per subscriber 80mA. Supply voltage DC 18V 1000 mA. Supply power AC220V- 50HZ±10%SMPS. Maximum output level 95dBuv. Through loss SAT:12dB terr:0dB(gain 10dB). Dimensin appr(LWH) 243mm263mm47mm. 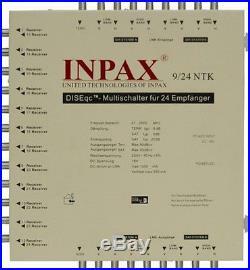 The item “9×24 satellite multiswitch INPAX 3 YEAR WARRANTY” is in sale since Wednesday, February 24, 2016. This item is in the category “Consumer Electronics\TV, Video & Home Audio\TV, Video & Audio Accessories\Satellite Signal Multiswitches”. The seller is “inpaxsatellite” and is located in TURKEY. This item can be shipped worldwide.